You might not realize it, but if there’s one thing our consumer-driven economy will always need, says Greenville entrepreneur Andrew Hurley, it’s packaging. At $500 billion a year, the global packaging industry is one of the world’s largest, he says – and yet very few in its workforce hold formal degrees in the complex subject. But it doesn’t have to be that way. With only a handful of formal education programs available, Hurley and his team are building another option from downtown Greenville: The Packaging School, an online education platform based on hundreds of short videos, quizzes and modules. The idea is to provide helpful, applicable skills and information based on the specific level and need of each student, he says. “Even the best packaging companies only have a handful of people with degrees in packaging,” says Drew Felty, co-founder of the school and CEO and co-founder of Greenville consulting firm Package InSight. Rather than have packaging professionals earn an entire degree, he says, they can brush up on topics and acquire new skills at their own pace, according to what they want to learn. “This curriculum is more holistic and has something to offer for everybody,” Felty says. 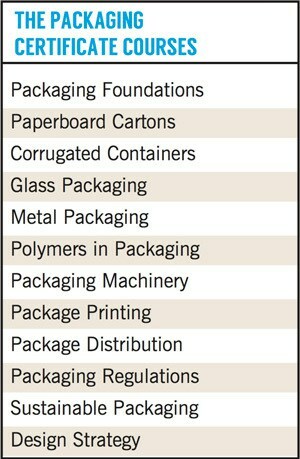 And packaging professionals are hungry for this kind of education, says the program’s director, Sara Shumpert. The group contacted 600 packaging professionals worldwide and found some were interested in everything from going through the course themselves to requesting a custom training for the rest of their employees, she said. They plan to launch the first certificate course on May 1, which will cover 12 different topics, each with between 50 to 100 short learning videos. The certificate will be licensed through Clemson University’s packaging program, and start out at $2,950. Students can go through courses at their own pace, but have the option of contacting instructors, participating on leaderboards and earning badges, among other engagement tools. After launching the first certificate course, The Packaging School plans to add courses, modules and options for different industries, levels and settings. The key, says Hurley, is providing a tool that not only elevates students’ knowledge of the industry, but begins to build a common core language around the often-nebulous packaging industry. Hurley, Shumpert and Felty currently operate in downtown Greenville’s West End, where they will continue to develop content and record modules for the school.